Millions of Americans made their way back home Sunday after a long Thanksgiving weekend, facing minimal stress and strain as they traveled by air, rail or road. 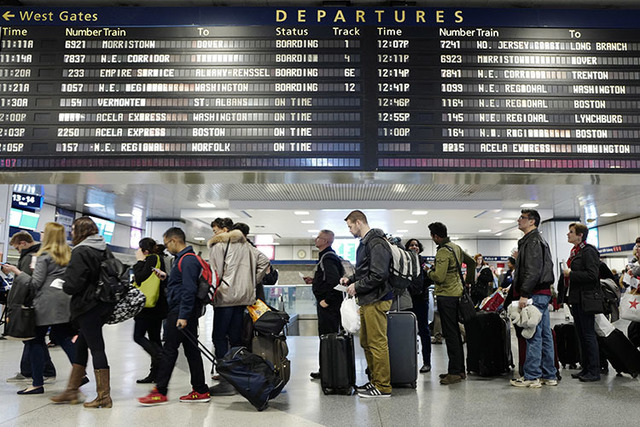 NEW YORK — Millions of Americans made their way back home Sunday after a long Thanksgiving weekend, facing minimal stress and strain as they traveled by air, rail or road. In Southern Nevada, as of sunset Sunday, traffic was backed up for about 16 miles in the southbound lanes of Interstate 15, local traffic officials reported. Earlier, I-15 had been backed up for about 25 miles. Also, showers and cooler weather slowed vehicles, especially in the area between Baker, California, and the Nevada border town of Primm. I-15 South to California, 16 mile backup, prepare for delays. Federal Aviation Administration data showed most U.S. airports with delays of 15 minutes or less Sunday afternoon. A large volume of passengers at LaGuardia Airport, in New York, and windy conditions at New Jersey’s Newark International Airport, led to slightly longer delays, the FAA data showed. Lines at airline counters and security checkpoints were short and flowing quickly at New York’s Kennedy Airport. Passenger Susan Merced said she overestimated her travel time, budgeting more than two hours to pass through security before her flight to New Orleans. At Ronald Reagan Washington National Airport, security lines were fairly long at 7 a.m. Sunday but subsided by afternoon, said David Mould, a spokesman for Metropolitan Washington Airports Authority. Lines at Atlanta’s Hartsfield-Jackson International Airport and Cleveland’s Hopkins International Airport were long but moving smoothly. The Transportation Security Administration anticipated screening about 2.5 million passengers on Sunday, about 500,000 more than an average weekday, spokeswoman Lisa Farbstein said. Air travelers were moving through security checkpoints at airports across the nation “quite smoothly” Sunday afternoon, Farbstein said, noting that the agency brought in additional officers on overtime to handle the influx of passengers. In California, the National Weather Service warned travelers about heavy winds and potential blowing snow on busy Interstate 5. Weather specialist Bonnie Bartling said wind gusts could reach 70 mph at the Grapevine mountain pass north of Los Angeles on Sunday. Washington state got more than 2 feet of snow in 24 hours. Besides driving problems, officials said there could be an increased risk of landslides. Travelers in Oregon faced a winter storm warning for the Cascades from Sunday afternoon until 6 p.m. Monday. AAA had estimated 48.7 million Americans would travel this Thanksgiving week.